Membership in Farm2uOnline.com/Bluebird gives you access to a harvest share box of farm fresh, locally grown and sourced food throughout the year. Members select the size suitable for their family and securely pay for in-season subscription shares and Add-on products. Members conveniently place orders during the weekly open ordering window, Fridays 8 am - Sunday 6 pm and pick up their orders the following week at our convenient pickup location on Thursday, Friday or Saturday. The weekly cycle repeats throughout the year. A 6 month membership is $25 (less than one dollar per week) during our Sign Up Special. There are no minimum or maximum orders, you may skip any week you like and product availability is always clearly indicated on the ordering pages. From time to time member's orders may not be entirely filled due to unexpected events such as weather changes, crop damage, quality shortcoming, or other unanticipated events. In these rare cases we immediately credit the member's house account with the full amount of the unfulfilled product(s) and can be applied to a future order, agree with member for rollover to a following week, or we make a substitution with a comparable product(s) of an equal or higher value. Our ordering system is not, at this time, setup to offer refunds. If you choose to skip a week, we simply roll over your credit to the following week (we do not maintain credit card information and therefore can not generate a credit back to a member's credit card). Bluebird CSA share boxes vary according to what local farmers are harvesting the day of delivery. Photos are examples of what is being harvested on local farms during the changing seasons. Click on the Producers page for a sample of Georgia grown and handmade products and pricing to see if this is a program that may work for your family. If you are local to Middle Georgia and Metro Atlanta and like the idea of access to all the best, farm fresh food our area has to offer, using the convenience of the Internet, click on the Sign Up button on the home page, and join our program. Thank you for supporting Georgia family farms and locally grown and handmade products with Bluebird CSA. 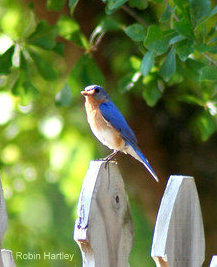 Bluebird began as an organic community garden and farmers market. We travel weekly to Georgia farms helping farmers harvest crops. 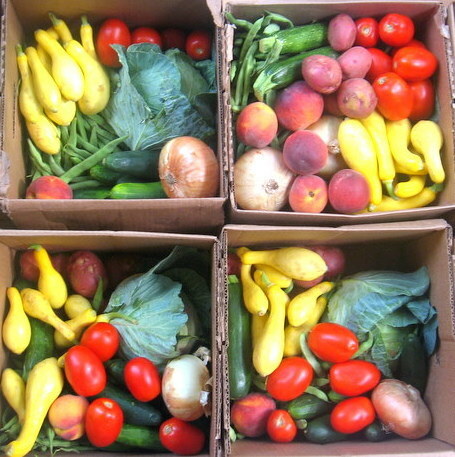 Bluebird packs share boxes with locally grown farm to table veggies and delivers to you. 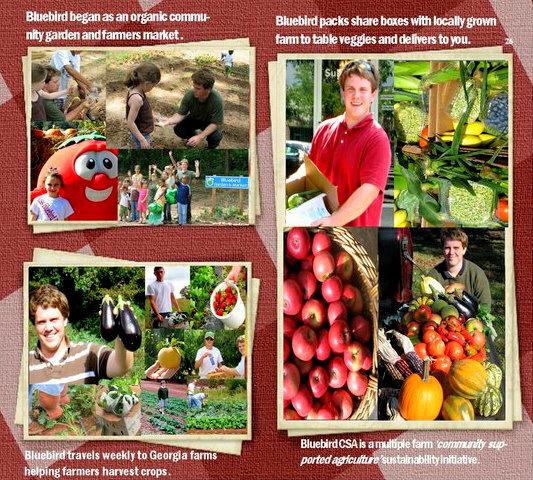 Bluebird CSA is a Multiple Farm Community Supported Agriculture (CSA) Sustainability Initiative. Top 5 Benefits to Nourish Your Life with Bluebird CSA from Bluebird Market on Vimeo. Top 5 benefits you will love with Bluebird CSA!! Watch and learn! Bluebird CSA weekly share boxes, filled with fresh veggies from mulitiple Georgia farms, nourish your life by providing what is needed to look and feel great! From seed to table, nourish life with Bluebird fresh veggies and community. Did you know greens are #1 on the ANDI Nutrient Density Scale? Enjoy kale, spinach, arugula, turnip and collard greens. Lightly blanch. Toss in the blender with just a bit of olive oil and freeze in ice cube trays. When frozen, place cubes in freezer bags. Drop a cube or two into soups, sauces, pasta, eggs, pilafs and stir frys. If you plan to make green smoothies, omit olive oil. Think of Farm2uOnline.com/Bluebird as being the first in line at every seller's booth at the local farmer's market. Product availability is exactly what you see in our ordering pages and is based on local seasonal output that local farmers personally produced and harvested. All the best of the harvest is gathered from local farms for your weekly produce share boxes. Share box pricing is clearly marked. There is no pressure to buy and there are no minimums. Our producers typically harvest their products at the end of the ordering cycle and Bluebird CSA then delivers the freshest, most nutritious products to members within days of ordering. The purpose of Bluebird CSA (Community Supported Agriculture) with Multiple Farms is to provide our members access to nutritious, natural, locally grown and raised foods by supporting sustaining local family farms. Farm2uOnline.com/Bluebird is a network of Georgia farmers, artisans and producers connecting communities who want all the best from local farms and food producers. Click the button to read more about how you can "Buy Georgia Made and Serve Georgia Grown!" Bluebird CSA connects local families with the highest quality, natural food producing local farmers providing a wide variety of fresh, naturally grown and raised in-season products. We only purchase foods from Georgia's locally owned family farms and independent makers whose prices reflect the real cost of production and distribution. In some respect, members seek to participate in a local CSA (Community Sponsored Agriculture) program like Bluebird, because membership is more affordable, product variety is greater, and there are the freshest available foods. Members enjoy easy access to nutritious, locally grown and raised food products throughout the year based on seasonal availability. We encourage you to join our network and experience the benefits of local foods. If you are not already a member, please go back to the HOME page and sign up. 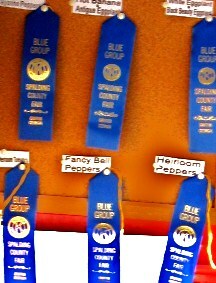 Farmer Bob is Grand Champion Vegetable Winner at the 2010 Spalding County Georgia Fair with 31 ribbons!